The HOA12DP Directional Outdoor Wireless AC Antenna is a heavy-duty, weather proof antenna for extending the range of your 802.11a/b/g/n/ac WiFi devices. 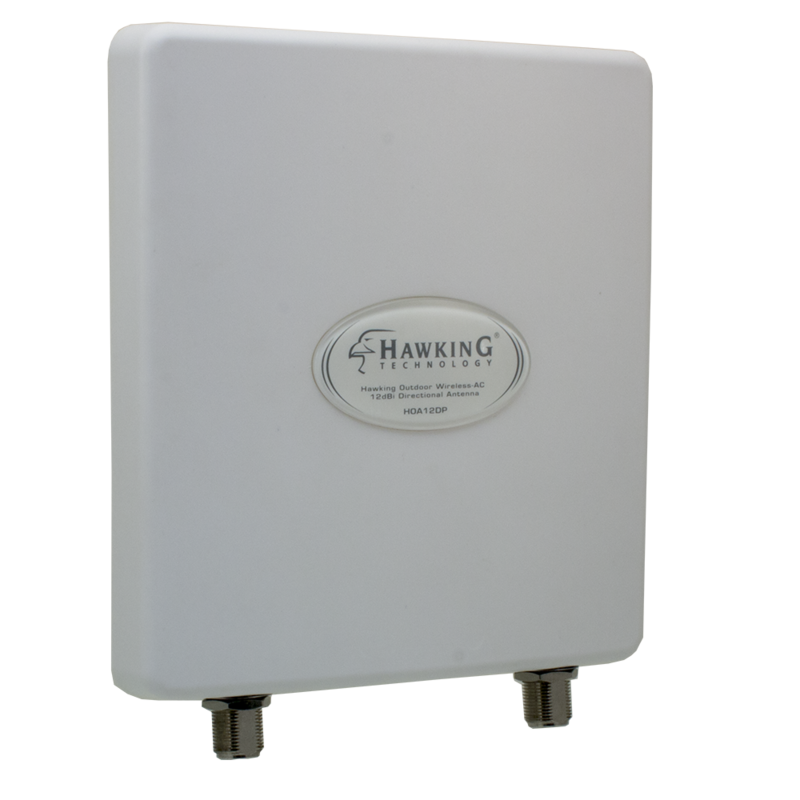 The HOA12DP Directional Outdoor Wireless AC Antenna increases the wireless strength from a standard 2dBi (decibels) to a staggering 12dBi, resulting in a 400% increase in the wireless coverage and strength. The most commonly used wireless bandwidth is 2.4GHz. 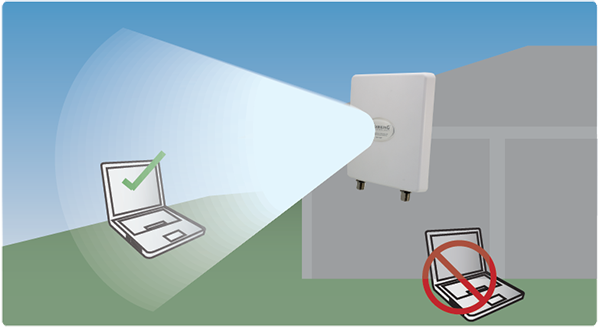 It is one of the older standards and provides good WiFi range and wall/obstruction penetration. However, neighbors, roommates, WiFi hot spots, etc. all use this same frequency which can cause interference and major slowdowns. It has limited bandwidth for simultaneous activities, so multiple users on the same network sending emails, video chatting, streaming movie, gaming, etc. can grind internet speeds to a halt. In addition, the same 2.4GHz frequency is shared between different devices (i.e. common household devices like microwaves and cordless phones), causing more interference. Wireless AC technology addresses this problem. It provides much faster speeds, providing more bandwidth so more things can be done quicker. 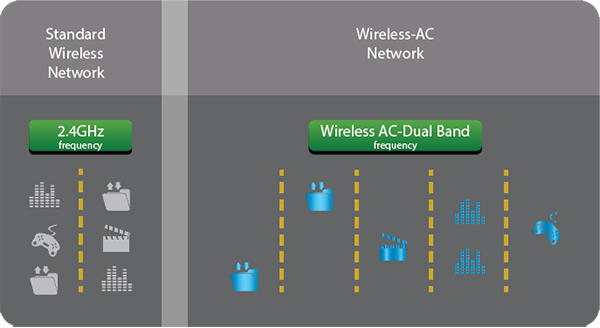 Wireless AC also uses the 5GHz frequency, which means separate channels from 2.4GHz users, thus avoiding the congestion. However, 5GHz does have a drawback of less range and not being able to penetrate walls and obstructions as compared to 2.4GHz. 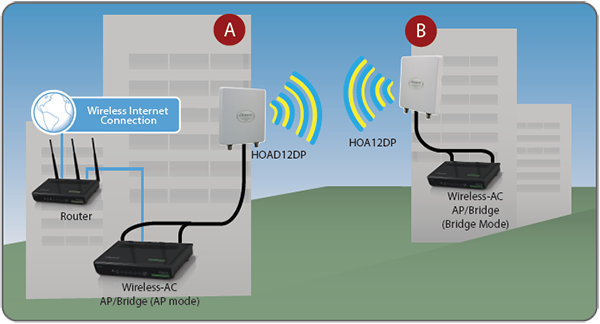 Hawking concurrent Wireless AC products provide maximum flexibility for WiFi networks. Wireless AC devices can connect to the popular 2.4GHz frequency for compatibility and range and also simultaneously off-load traffic to a faster, less-crowded 5GHz AC frequency for speed. The users can simply pick the network of choice. The HOA12DP Directional Outdoor WiFi Antenna strengthens and extends the Wireless AC signal for long range, high traffic wireless networks. The Directional Antenna concentrates the signal in one direction for more wireless strength and longer range. The HOA12DP Directional Outdoor Wireless AC Antenna is ideal for long range Point-to-Point Outdoor WiFi Antenna applications. As shown in the diagram, use a pair of Directional WiFi Antennas, one on each end (location A & B), for optimal results. 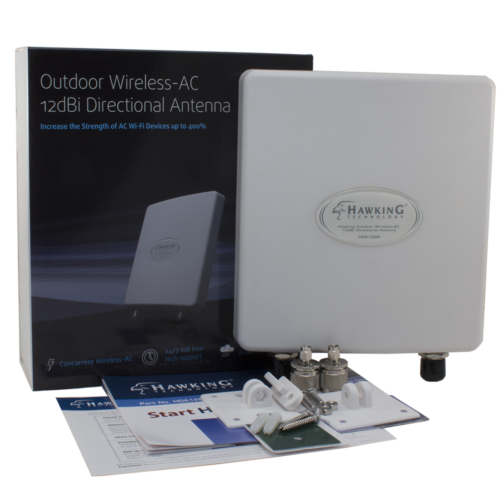 Simply replace your device antenna with the HOA12DP Directional Outdoor Wireless AC Antenna. 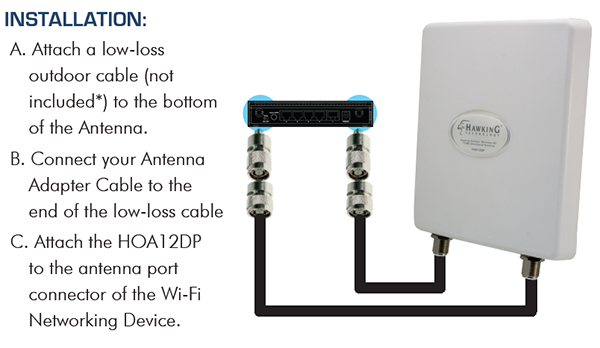 The HOA12DP antenna has N-Type connector and comes with N-Type to SMA adapters, the most commonly used antenna connector. For other type of adapters, please visit Hawking Tech’s website for additional selections. Note: An outdoor low loss antenna cable (model number HAC10N, HAC20N, or HAC30N) is required for outdoor installation and must be purchased separately. Depending on your set up, a shorter cable is recommended for minimal signal degradation (cable loss) due to cable length.